Peace Councilor Dr. Hizkias Assefa is the founder and head of the African Peacebuilding and Reconciliation Network. He is a former Distinguished Fellow of the Institute of Conflict Analysis and Resolution at George Mason University in Fairfax, Virginia; and is currently Professor at the Center for Justice and Peacebuilding hosted by Eastern Mennonite University in Harrisonburg, Virginia. In the past twenty years, he has led mediation and peacebuilding efforts for more than twenty-five African, Latin American and Asian countries and for the United Nations. Dr. Assefa is currently serving as a mediator in the ongoing civil war between the Government of Uganda and an insurgency group called the Lord's Resistance Army. This war has so far killed over 100,000 and displaced about 2 million people, a situation currently described as the globe's worst humanitarian disaster. 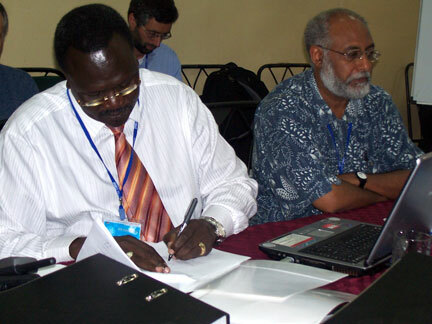 The photograph above shows Dr. Assefa (on the right) with the co-mediator Dr. Reik Machar, Vice-President of the Government of Southern Sudan, at the signing of the Cessation of Hostilities Agreement on August 27, 2006 in Juba, Sudan. In a series of e-mails sent from Africa to the Committee for the Peace Council, Dr. Assefa described the state of his efforts. Following are edited excerpts from Dr. Assefa's correspondence, printed here with his permission. "I am sorry that I have been out of the communication loop for a while. I have been involved in the mediation process for the civil war in Northern Uganda, which has been one of the most stressful times of my life. The past few months have been nothing but extremely taxing, unpredictable and at times dangerous. Face-to-face negotiations between the parties have been going on now since over a month ago. I have been co-facilitating the talks along with the Vice President and the Minister of Internal Affairs of the Government of Southern Sudan . At this phase of the mediation process, since the only place where the top-level leaders of the insurgency group feel comfortable to meet the mediators is in the forests at the DRC [Congo-Kinshasa]-Sudan border, we have been conducting many meetings there while the primary venue for the formal negotiation between the insurgents and the government delegates has been in Juba, the capital of Southern Sudan. "Despite the fact that the process has been demanding, it has also been a very interesting mixture of Track-One and Track Two approaches, top-level political negotiations and simultaneous grassroots peacebuilding activities. However, what has been happening at the political level has been exasperating. The level of deep animosity and distrust among the parties makes whatever proposals coming from the other side automatically unacceptable. "Aside from the problem of dealing with the parties, dealing with other governments that have direct or indirect stakes in the conflict has been equally baffling and excruciating. Although many governments are coming on board slowly to support this mediation process, others seem to be itching for a military solution. It is difficult to understand why they think that something that did not work for the last 20 years will work now. But that is where we are. "All these have made the mediation so complicated. When we feel that the process is beginning to move forward, something happens and the whole thing begins to go backwards. Now we are stuck on the negotiations on cease-fire and its monitoring. "Some progress has also been made on developing common understanding for the modalities of the resettlement of the 2 million internally displaced people. The terrible thing is that the fighting is still going on while the negotiations are proceeding. In the past week alone over ten people from both sides were killed, and yesterday, a prominent leader of the insurgency was gunned down. This morning, we hear three more have been killed. This has prompted the delegation of the insurgency group to walk out of the negotiations, and we are shuttling between the parties with the hope of keeping the negotiations alive. "While this is the status on the formal political mediation front, we are opening a back door to the process in order to make it possible to have inputs and participation by civil society -- religious and traditional leaders, representatives of victims of the conflict from all affected regions, and even political representatives from northern and eastern Uganda. Some very important developments are happening on that front. We were able to organize informal dialogues between the leadership of the insurgency and civil society inside the rebel base in order to persuade the latter to seriously engage in negotiations. "It was so inspiring to see elderly religious and civic leaders pushing trucks stuck in a horrendous quagmire on the journey to the headquarters of the insurgents just to sue for peace -- all covered in mud from head to toe. A journey that would have taken about four hours took us close to twenty hours one way because of weather conditions. The same civil society group is also engaging with the government not to scuttle this opportunity for peace. "'This peace process is not yours alone. It is ours as well. We demand that you make peace as soon as possible for our sake,' they told them. It was a special moment for me. It seemed that at last the community leaders and victims were speaking truth to the mighty. It was energizing to hear that voice. "Civil society leaders are talking about organizing marches and peace convoys by a large contingency of women from the war-affected areas to tell the parties to the negotiations that peace must be given a chance and that they must not play political games with the process. They are lobbying their elected representatives to amend some of the laws that have been obstacles to the negotiations, like their list of terrorist organizations, etc. Some of them are looking at their own traditional systems of justice to see how it can be overhauled to address issues of impunity and reconciliation in ways that would satisfy different stakeholders. This side of the work has been quite satisfying. It was energizing for me to see community leaders and victims speaking truth to the mighty. "The process so far has been having so many ups and downs that it is utterly exhausting physically, emotionally and spiritually. The infrastructure here does not allow for any distractions except to sneak in a few more hours of extra sleep here and there when possible. "I hope things are well with all of you." On August 29, 2006, a cease-fire between the Government of Uganda and the Lord's Resistance Army went into effect, clearing the way for long-term peace negotiations. A lead Ugandan newspaper described it as follows: "The truce is here. The guns have finally fallen silent. The cessation of hostilities agreement signed on Saturday [Aug. 27] between the Government and the Lord's Resistance Army (LRA) Took effect yesterday at 6:00 am. This is a landmark truce that could spell an end to the 20-year rebel insurgency in the north." "I am happy to say that we were able to have a breakthrough. Yesterday, we signed an agreement on Cessation of Hostilities between the government and the insurgents that included significant elements of cease fire and even the first steps towards demobilization. The rebel troops have agreed to move out of their bases of operation in Uganda, the Democratic Republic of the Congo, and Sudan and to be given safe corridors monitored by international forces to assemble at designated locations on the border of Southern Sudan. They will be protected by the forces of Government of Southern Sudan. This way the clash between the insurgents and the Ugandan government armed forces will cease; the harm that was being inflicted on the civilian population will also stop. We are also in the process of getting the insurgency group to agree to release the children under their control to humanitarian agencies. "This cessation of fighting between the government and the rebels will allow the people in the horrendous displaced people's camps to begin to return home with the assistance of the UN and other agencies. So we have opened up significant doors that would allow for negotiations on the remaining issues more vigorously and expeditiously. Let us hope the momentum continues." "The Cessation of Hostilities Agreement has been a significant accomplishment of this mediation process. The forces of the Lord's Resistance Army have left Northern Uganda with the exception of very few remnants. The agreement has held so far and there has not been any armed confrontation in Uganda between the government and the rebel forces. This cease fire has enabled many of the displaced people to begin returning home. So far, about 300,000 people have returned to their homes after 20 years of life in displacement, and it is expected that this number will reach 500,000 by the end of December. The number of children called âNight Commuters,' who used to leave their homes every night and trek to towns to sleep in protected shelters has gone down from 35,000 to less than 8,000. These are all welcome developments. However, the momentum in the negotiations over the remaining issues remains very slow and the patience of everyone is being tested to the limit. "The people of Northern Uganda need the prayer of all of us that this peace process reaches its objectives and that nothing would happen to reverse the gains." 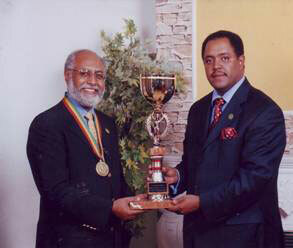 The photograph below shows Peace Councilor Dr. Hizkias Assefa receiving the first Peace Award of the Year from the Hon Mussie Hailu, chairman of the Interfaith Peace-Building Initiative, in Addis Ababa, Ethiopia on 21 September 2006. The award honored Dr. Assefa's "outstanding contribution to humanity in the area of peace-building, reconciliation and conflict resolution and for his exemplary work of living for the sake of others."